I wasn't sure quite what to expect when I received this DVD to review. It's being distributed by Miramax--okay, that's a good sign. It's won a number of festival awards: Official Selection, Sundance Film Festival; Discovery Award, Toronto Film Festival; Official Selection, New Directors/New Films. Also a positive sign. I tend to shy away from foreign films. I mean, if I want to read, I'll sit down with a book not a movie, right? But here's the thing: I loved Pan's Labyrinth and Amores perros and City of God and Volver, so subtitles really shouldn't be an issue. I've found that when I'm really enrapt in a great film, I don't even realize that I'm reading the words anymore. So I got over my reading reluctance and inserted the disc in my DVD player. What I experienced was a smart and quirky coming-of-age story set in Oslo, Norway. With a story that plays with "what if?" futures and tangential flashbacks, Reprise tells the story of a group of twenty-somethings navigating life and relationships and trying to make their way in the world. Specifically the film concentrates on two friends: Phillip (Anders Danielsen Lie) and Erik (Espen Klouman-Høiner) who set off on critical journeys as they both submit their manuscripts for publication. Phillip's novel is accepted and published, but he eventually suffers a mental breakdown and spends the rest of the film trying to recapture the happiness and possibilities he experienced prior to his psychotic break. Erik's manuscript, on the other hand, is rejected. But he reworks his novel and it is accepted--and then he faces all the good and bad which comes with being a "wunderkind." I was amazed to learn that Trier (a distant cousin of Lars von Trier) is a novice director given the assured and stylish result of his efforts. Working closely with cinematographer Jakob Ihre and editor Olivier Bugge Coutté, Trier was inspired by classic portrait painters like Vermeer and French New Wave cinema and directors such as Alejandro González Iñárritu. This collaboration and inspiration is evident in the beautifully framed shots, verité conversational feel and the fluidity of time and place to tell the story. In addition to the conversation with Trier and Vogt I mentioned earlier, the DVD extras include a behind-the-scenes look at cinematography, set design, editing, sound design, etc. as the film goes from pre-production through production and then post-production. If you have any interest in how all the pieces of a film come together, this was one of the most enlightening "making of" featurettes I have ever seen. There's also a feature on how the film was cast, an extra giving insight into how the film's crucial love scene was shot, as well as deleted/extended scenes. 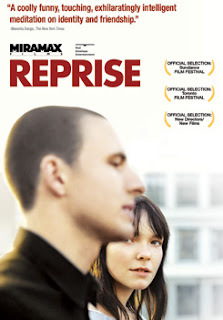 If you have no fear when it comes to foreign films and subtitles, I highly recommend Reprise. The film about finding your way and your voice is style AND substance from a director that I'm sure we'll be seeing much more of.